Mikrofon følger ikke med. En må kjøpe en av mikrofonene under. Tilbehør til Wildlife Acoustics Song Meter SM4BAT ZC. 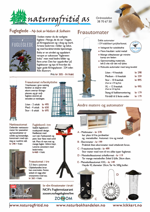 Wildlife Acoustics Song Meter SM4BAT ZC har relasjoner til. The SM4BAT ZC is a native zero-crossing recorder. While recording less information than a full spectrum recorder, it may be "good enough" for some applications while offering lower power consumption, smaller storage requirements, and lower cost.